St Hilda Sea Adventures run two charter boats, St Hilda and Seahorse II, and are cruising out of Dunstaffnage Marina, just three miles North of Oban, the gateway to the Hebridean Isles. They offer unique small ship cruising holidays/tours on the beautiful West coast of Scotland in the Inner and Outer Hebrides; an unforgettable adventure for all ages. Operating from Port Ellen Islay, our amazing boat tours offer you the chance to see the most spectacular wildlife that our shores have to offer – seals, porpoises and an abundance of seabirds. You may even catch sight of a Sea Eagle or a Sea Otter! Our various tours include nature watching around Islay including a Special area of Conservation and a visit to the world’s third largest whirlpool at Corryvrechan. Fishing and Foraging tours are also available. With a maximum of 12 guests on board, our choice of cruises takes in the Islands of the Inner and Outer Hebrides and St Kilda. The itineraries have a high degree of flexibility and include guided trips ashore to get close to the amazing landscape, heritage and wildlife of the Hebrides. Elizabeth G is also the ideal size for private charter for groups of friends and family looking for a relaxing, once-in-a-lifetime holiday or an exhilarating activity adventure. Hebridean Island Cruises has been setting the benchmark for luxury cruising since 1989. Featuring some of the finest Privately Escorted Tours, our small, five star luxury cruise ship, the Hebridean Princess, affords the guests the highest standards of luxury cruise ship accommodation, together with a level of service from an almost forgotten era. Escape to another world. Cruise the sheltered waters and stunning coastline of Argyll and the Inner Hebrides. Enjoy a fabulous Scottish cruise aboard our beautifully converted traditional wooden vessels which access the remote sheltered waters and idyllic, scenic places on the South West Coast of Scotland. Our cruises provide excellent hospitality and wonderful food for up to 12 guests in six double ensuite cabins. Chalice Charters operate out of the port of Oban, gateway to the Western Isles and Hebrides of Scotland – the last natural wilderness in Europe – offering Scottish island cruises, wildlife cruises, bird-watching and whale watching cruises, private charter, and research and survey services. Are you interested in the fabulous wildlife and natural history of the Western Isles and Hebrides, or a visit to St Kilda. Perhaps a walk over beautiful islands and remote coastal areas or just sit back, relax and cruise. The Western Isles and Hebrides offer fantastic locations for photography and painting. We are based in Oban though pick ups can be arranged from anywhere. Travelling in a safe, dry and comfortable environment in one of our two 11 metre cabined Redbay RIBs, you can reach the islands in no time at our 30 knot cruising speed. Our services range from the commercial side to our scenic tours of the West Coast. If the breathtaking scenery of Gigha and the Inner Hebrides has drawn you near, Gigha Sea Tours provides you with the opportunity to gain a fresh and exhilarating perspective on our stunning landscape & wildlife, while at the same time having a lot of fun! Experience a whale watching boat trip in Scotland with Sealife Adventures, based on the mainland near Oban, Argyll, Scotland. Cruise through the infamous Corryvreckan Whirlpool. The stunning panorama of the Inner Hebrides includes Mull, Iona Jura and Islay. Kintyre Express operates passenger ferry services from Campbeltown to Ballycastle and Troon to Campbeltown. We also supply private charter services for up to 12 passengers. Gordon Grant Tours provides trips to the Treshnish Isles, Staffa with it’s famous Fingal’s Cave and to the Isles of Mull and Iona. The company is based in Oban and brings you to some of the most beautiful and interesting places on the West Coast of Scotland. Based in Tobermory, Isle of Mull, Island Shuttle operates a fast RIB service to all locations within a 30 Mile radius of the coast of Mull. We specialise in a fast boat service from Tobermory to Islands such as Coll, Tiree, Muck, Rhum, Eigg, Lismore, Seil and Easdale, as well as a shuttle service to and from many mainland destinations. It is a 45 minute sea journey to Staffa and Fingal’s Cave which is always splendid and atmospheric with basaltic columns formed 59 million years ago. Puffins can be seen ashore in season and often guillemots, fulmars, great skuas, eider ducks, gannets, kittewakes, black-backed gulls, great northern divers and razorbills on the water. 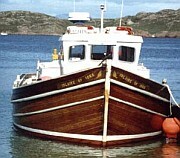 A traditional wooden open boat, ‘Birthe Marie’ is available for charter from the Isle of Iona. Maximum 11 passengers. Operates mid April – late September. Scheduled boat trips (up to 3 hours) also operate on certain days. Contact Mark Jardine. Tel: 01681 700537. Turus Mara, which means “sea journey”, offer a cultural aspect to their cruises. One of few tourism activity operations run by an indigenous family ? part of the commentary will usually be in Gaelic, the original language of the West Highlands and Islands of Scotland. Turus Mara Cruisetours operate out of Ulva Ferry on the West Coast of the Isle of Mull. A Guide to Every Scottish Island. This is the definitive reference to the Scottish islands, and one of the best Scottish books on any subject you'll ever see.